The volume of finely atomized water dispersed in close proximity to the flame creates a high quantity of water vapor, which displaces the surrounding air and thus its oxygen, choking the flame. The transition from the liquid to the gaseous state absorbs a high amount of energy. 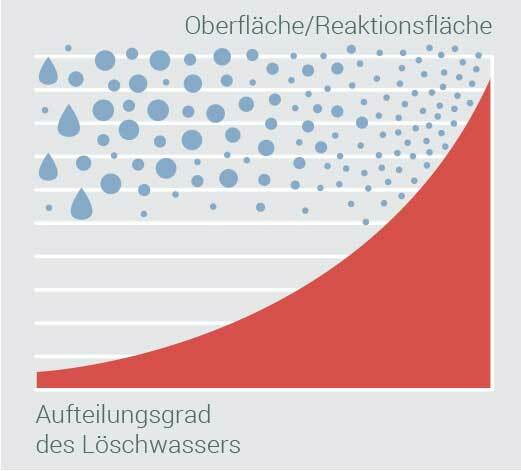 The enormous increase in surface area created by the atomization of the water exploits the enthalpy of vaporization to its maximum. 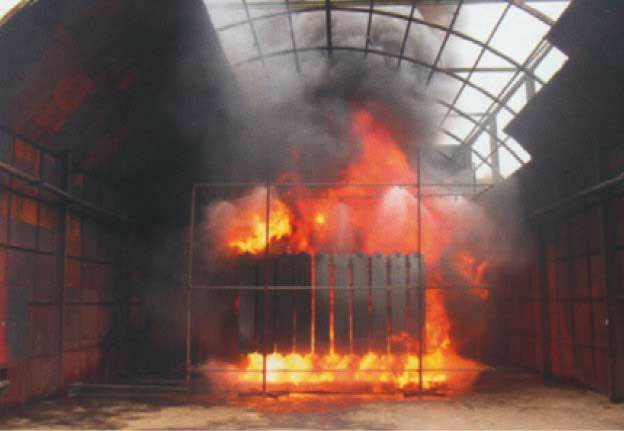 In addition, the high-pressure water mist will also suppress smoke gases that are highly toxic to humans and animals. 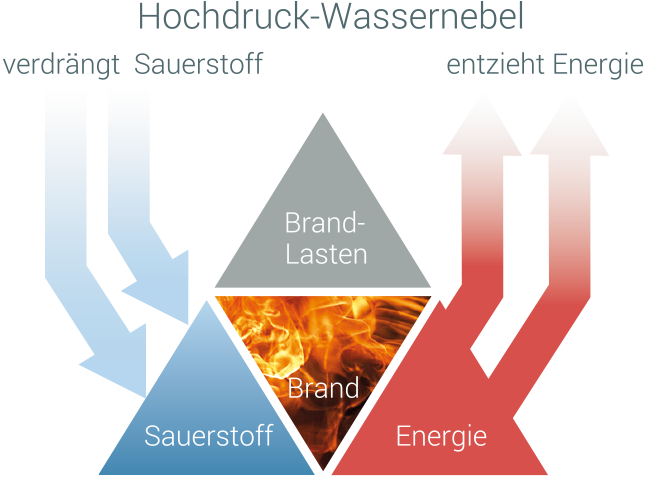 Another effect of the water mist – otherwise only achieved by powder-based systems – is the blockage of heat radiation, which is a significant factor in the propagation of fires. All the benefits of different fire-extinguishing methods packed into one! 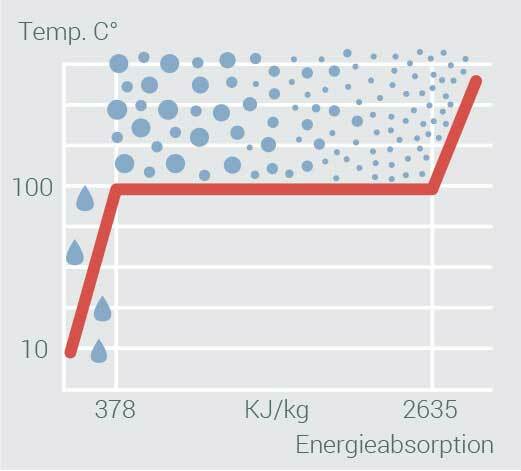 The phase transition during the evaporation process absorbs a tremendous amount of energy, which is withdrawn from the fire. Thanks to their large reaction surface and the gaseous dispensation of the aerosol, HPWM systems have an ideal evaporation ratio in the extinguishing medium. 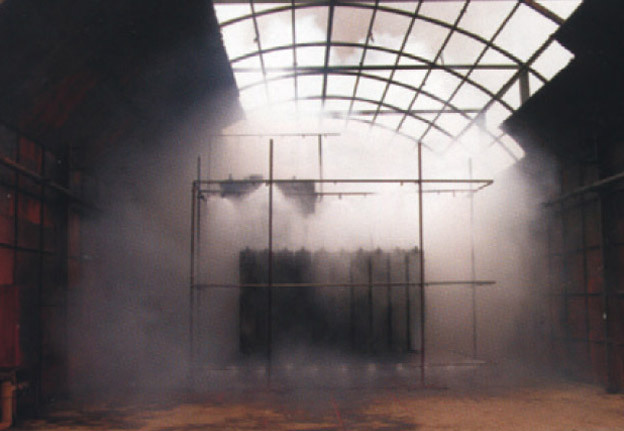 The low quantity of water that a high-pressure water-mist fire-extinguishing system requires – compared to traditional sprinkler systems – not only reduces the amount of water that has to be stored but also the damage in case of activation. For this reason, downtimes in the affected areas will be significantly shorter, thus reducing the overall damage. The piping system consists of a main pipe centrally located in a frost-free environment. Depending on the case at hand, one or more pipes lead to each of the designated fire sections. In each section, the front end of each supply pipe is fitted with a shut-off valve with remote indication. The piping system consists of stainless steel. The main pipe is joined with high-quality press fittings, the distributor pipes and the pipes connecting to the nozzle are joined with cutting rings. 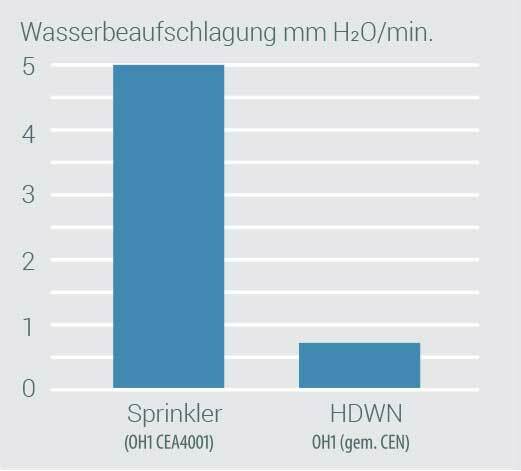 The water consumption per nozzle varies between 2.8 and 25 liters (0.74 and 6.6 gallons) per minute, depending on the characteristics of the room. This means a significant reduction of water consumption, compared to a traditional sprinkler (80–250 liters = 21–66 gallons per minute) and also permits smaller pipe diameters. 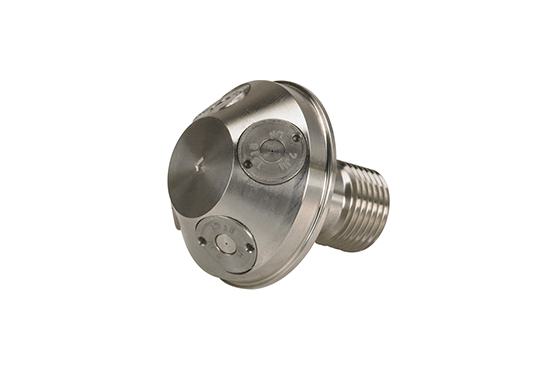 The main pipe usually has a diameter of only 33 or 42 mm, and pipes leading to the nozzles have diameters of 10 or 12 mm, allowing extremely simple installation. 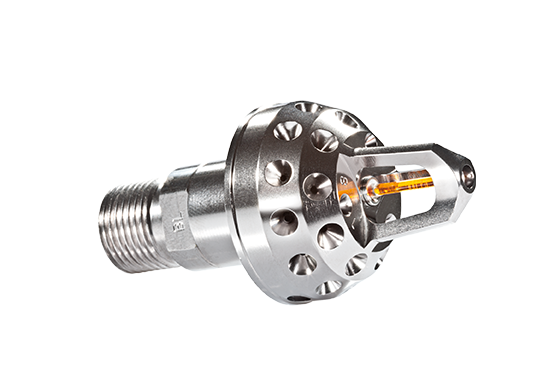 Nozzle heads may be supplied with either open (deluge) nozzles for “dry piping” systems or closed nozzles with “melting fuses” or “glass bulbs” for “wet piping” systems. 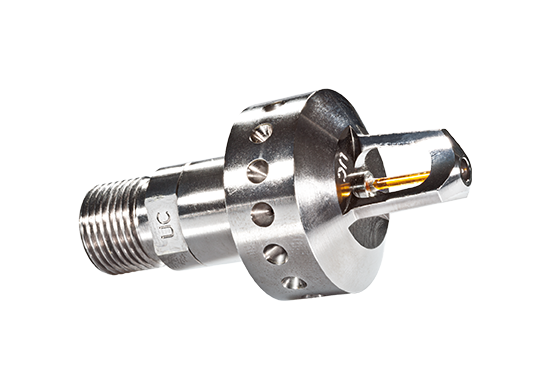 Open-nozzle systems consist of a nozzle head with micro-nozzles or of separate micro-nozzles mounted directly on the supply pipe. With an open nozzle, the water will be atomized as soon as the high-pressure pump is activated either manually or by sensors signaling a fire. 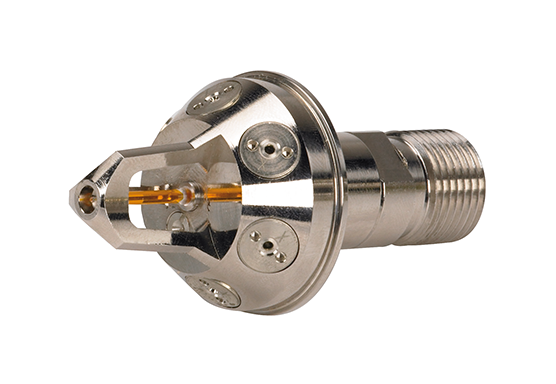 Closed-nozzle systems also consist of nozzle heads equipped with micro-nozzles, but they are secured with glass or plastic bulbs that will melt as soon as the temperature exceeds a certain threshold – starting at 56 °C (133 °F), various options are available – and thus release the water. Each nozzle is equipped with a filter to prevent clogging. 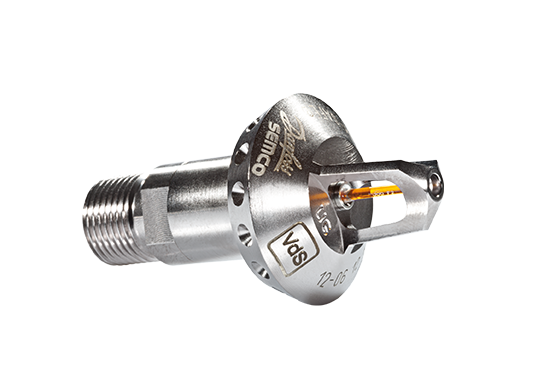 Each nozzle head is available in polished chrome-plated brass or polished stainless steel, the latter for use in an aggressive environment. For design or architectural purposes, nozzles may also be supplied in various colors on request. 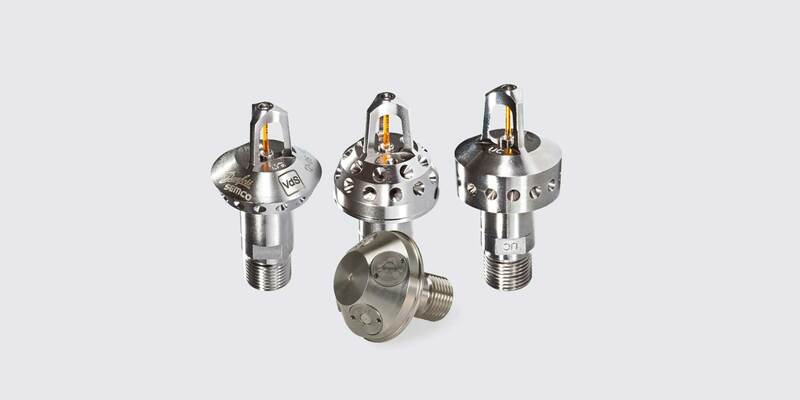 The water consumption will be determined individually in each case, based on the existing fire load, and it can be adjusted to the actual requirements anytime by exchanging the micro-nozzles in the nozzle head. To activate the system, a trigger system for the high-pressure pump is required. The system may be activated either by a signal from a pressure controller (drop in pressure triggers nozzle, closed system) or from a fire detector or fire alarm system. In addition, the system may be activated manually. These versions may be fed by automated as well as semi-stationary Callies vehicle systems.